Greenleaf Book Group Press, 9781608324040, 312pp. For years we ve been inundated with bleak forecasts about the future. But in this electrifying new book, author Byron Reese debunks the pessimistic outlook as dangerous, and shows instead how technology will soon create a dramatically better world for every person on earth, beyond anything we have dared to imagine. With the art of a storyteller, Reese synthesizes history, technology, and sociology into an exciting, fast-moving narrative that shows how technological change has had dramatic effects on humanity in the past. He then looks forward at the technological changes we know are coming from genetics, nanotechnology, robotics, and many other fields and explores how they will vastly increase wealth, prolong our lifespans, redefine human rights, and alter the social fabric of the world. 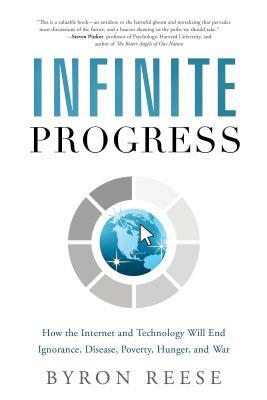 Reese explains how the Internet, human ingenuity, and technological innovation will help us forever end the five historic plagues of human existence: ignorance, disease, poverty, hunger, and war. With a rational and researched optimism, Reese sees the future not as a world in a downward spiral, but as destined for progress beyond our imaginations. As Reese looks forward, he notes that we are gaining speed, not winding down. We are blooming, not withering, as we leverage the greatest natural resource on the planet: the human mind. The future of Earth's inhabitants has never been brighter. If you want to get excited about the future, then this is the book for you. Byron Reese is the founder of several high-tech companies and has obtained or has pending numerous patents in disciplines as varied as crowdsourcing, content creation, and psychographics. Together the websites he has launched have received over a billion visitors, covering a variety of topics including news, reference, and history. Bloomberg Businessweek credits Reese as having quietly pioneered a new breed of media company and the Financial Times describes him as one of the new wave of internet entrepreneurs out to turn the economics of the media industry on its head. Even Business Insider calls him an awesome guy. Reese currently heads up research and development for Demand Media (NYSE: DMD) "